With the presence of a large pool of participants, the global pond liners market is displaying a highly competitive business landscape, finds a new research report by Zion Market Research (ZMR). AGRU, BTL Liners, Carlisle, Emmbi Industries Limited, Firestone, GSE Environmental LLC, HongXiang New Geo-Material Co. Ltd., and Huadun Snowflake are some of the key vendors of pond liners across the world. These players are focusing aggressively on innovation, as well as on including advanced technologies in their existing products. 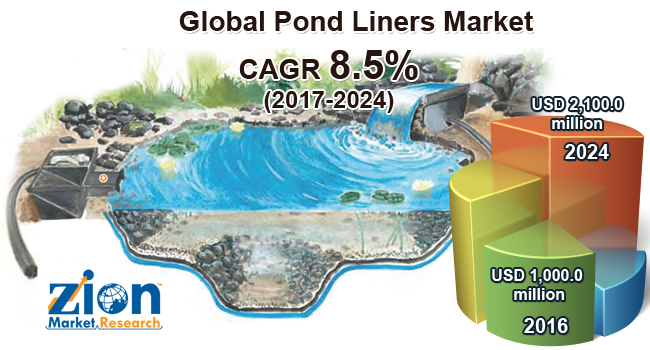 Over the coming years, they are also expected to take up partnerships and mergers and acquisitions as their key strategy for business development states the pond liners market study. “Rampant rise in water conservation activities witnessed across the globe is the key factor driving the growth of pond liners market,” says the author of this study. Apart from this, the rise in the construction of artificial ponds or lakes across commercial and residential sites is set to contribute tremendously towards the surge of pond liners market, both in terms of volume and size in the years ahead.